Aggressive tread pattern offers excellent all-weather traction. Block/rib designed shoulder provides reduced driving noise and promotes even wear. 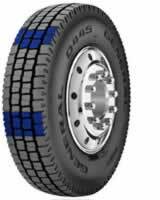 Multi-service tread compound provides long tread life in on/off road conditions.